Stolen power and jerry-rigged wiring at illegal marijuana grow houses often results in house fires. Marijuana plants being cultivated in a grow house. Stolen power and make-shift wiring is used to run lighting, irrigation and air-filtration systems. SCE Fire Management Officer Scott Brown shows L.A. County Fire Battalion Chief Veronie Steele-Small a section of power line that was frayed by gunfire. Illegal grow houses are among the hazards highlighted at SCE’s electrical safety class for first responders. There’s one thing Los Angeles County Fire Battalion Chief Veronie Steele-Small says she won’t forget: responding to fires at illegal indoor pot farms, or “grow houses,” is deadly serious business. 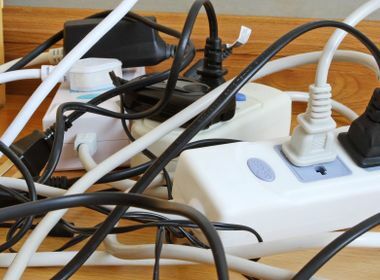 Illegal marijuana-growing operations, which can be electrical houses of horror, were among the many electrical hazards Steele-Small learned about at a recent electrical safety class for first responders held in Covina. 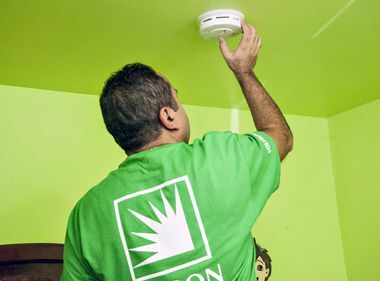 The class, taught by Scott Brown, a fire management officer for Southern California Edison, is held at a number of fire stations throughout the utility’s 50,000-square-mile service territory each year. One of the major dangers posed by grow houses is that illegal pot growers are notorious for stealing power from utilities. To do so, they bypass meters and circuit breakers — which means firefighters can still get electrocuted even though they have shut off the power at the main panel. California law enforcement authorities uncover a few hundred grow houses every year. Responding to a fire can be tricky because they often look like any other house in a residential neighborhood, hiding the dangers that lurk inside. Steele-Small says that added risk means exercising extra caution when responding to fires at grow houses. The class also addresses a number of newer electrical hazards beyond grow houses that may not have been an issue just a few years ago. These new hazards require strategic assessment of a situation before rushing in to extinguish flames and save lives. 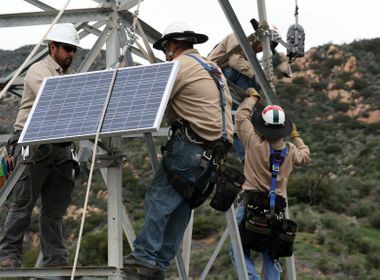 In recent years, tens of thousands of homeowners in Southern California have installed solar on their rooftops and, working with SCE, they are now connected to the grid. Having these installations on rooftops can complicate access for firefighters. When properly installed and connected to the grid, these systems have safeguards in place to protect first responders, but not every installation is guaranteed safe. Do-it-yourself solar panels, which may be installed improperly, causing backfeed, or electric current flowing in reverse direction from the house onto power lines, could cause electrocution. Always assume that a downed power line is live. Watch for live wires that may be camouflaged in high-vegetation areas. Never touch objects that are in contact with a downed wire, including sign posts, metal fences, pools of water or even wood if it’s wet or dirty. Regardless of the situation, Brown’s message to firefighters and other first responders: “When it comes to high voltage, rely on the experts. Our troublemen are able to de-energize any line for you at any time. Just call us and tell us what you need, and we’ll be racing to get to you.